Updated Friday September 26, 2014 by Hamilton Football Association. On September 24, 2014 the CFL Hamilton Tiger-Cats and Play Action Program held an open combine for football athletes from ages 7-14. The Tiger-Cat "coaches" ran drills that tested the players' athleticism and stressed the importance of laying down the foundation of working hard, finishing drills, and doing things right. The turnout was excellent for players, parents and coaches alike. HFA sent its entire Fall league at the one-day event. It was a beautiful sea of Black and Gold! The combine comes together thanks to John Williams Coordinator, Play Action & Community Development and Scott Vickers Coordinator, Commununity and Corporate Engagement. 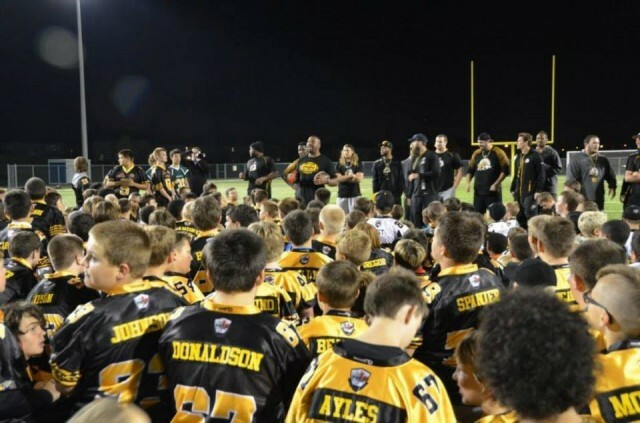 The Play Action Program, with its inception in 2012 sees the Ticats and their partners help minor football organization develop the game at the grassroots level. Special thanks to the Roar Club for assisting in coordinating the event. For the Ticat pros, they've reached the pinnacle of where they can go in their sport, so with any other kid locally hoping to do the same thing, these pro athletes are looked up to. Last night was a great opportunityto help out perhaps the next crop of homegrown stars! Also to view more pictures and share your pictures at https://hamiltonfootball.shutterfly.com a private HFA picture sharing site that tells our team stories via your photographs. No more I wish I brought my camera if we all learn to share.